Technology has come a long way, highly impacting our lives. It has become possible to feel the beauty of the snow-clade alpine ranges while enjoying hot chocolate in your apartment at SF bay. A VR headset can virtually take you anywhere. From the peak of Mount Everest to Mariana trench in Pacific ocean, from Slums in Africa to castles in Edinburgh, being in different places without moving a tad from your couch has become a possibility. We have cars that don’t need a chauffeur, the device in your pocket or may be in your hand is way more powerful than a personal computer 5 years ago. We definitely are living in the most exciting time of humanity. We, for quite some time, have been witnessing technology disrupting everything and changing the way we live. And healthcare has gotten the Midas touch of technology and got redefined, too. Theranos, for example, has made removing blood multiple times for different tests a thing of the past. Today, a single drop of blood can be used for 100 different tests. Activity trackers have decreased doctor visits multifold. Your doctor could now consult you from his clinic as he has all the information that he needs. These were some of the advancements we witnessed in the past few years. But the future of healthcare is even more exciting than you could ever have imagined. We will be forever young, cancer may get cured, surgeries will become way way more successful and what not! And to give you a glimpse of what you may be seeing in the future, I have made a list of 5 advancements which you will witness in the future. At first, they may sound like sci-fi to you. But, my friend, even today’s science was yesterday’s sci-fi! 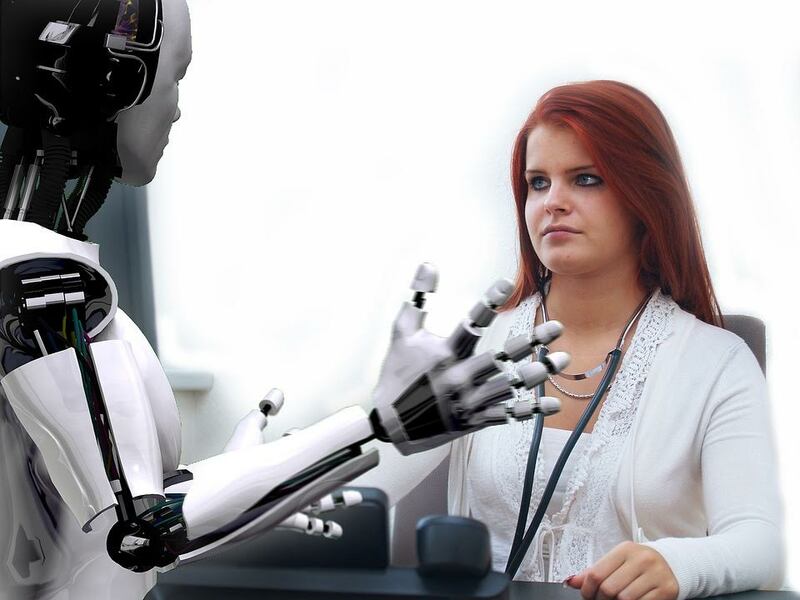 In the future, robots will be joining hands with hospitals. There will be robotic nurse assistants. Not only this, there will be robotic surgeons too. There is one such robot already in existence named Da Vinci Surgical robot which is primarily made to assist a surgeon. It provides an enhanced view of a patient’s internal organs and helps in precise instrument handling to minimize surgery failures. There are robots capable of conducting a complex surgery on their own. You know what all these things will one day lead to- a doctorless hospital. That’s cool, but I will miss those beautiful nurses. Nanomedicines, as the name suggests, is a technology that works at nanoscale. The nanoparticles in it will deliver drugs at lightning speed to the inner cells which will enable super faster recovery from an illness. The gold nanoshell hits cancer at the sweet spot and could knock it out of the park in the future. FDA last year gave green signal to treatment of pancreatic cancer using nanomedicines. The day is not so far when many, if not all, kind of cancer will hold no water. 3D printing will take tissue engineering to a whole new level. And Chuck Hull, father of 3D printing, might have not guessed that night that this accidental invention by him will be so impactful in the future. Scientists at Wake Forest Baptist Medical Center have developed a first-of-its kind “bio-printer” that can print bones, tissue, and muscle that are biocompatible with human body. They tried their hands on a biocompatible human ear. How about removing the DNA sequence that genetically transfers diabetes from a mom to her new born baby? Or modifying that DNA code which is cause of the cancer in a body? You may have gotten an idea of the power that genetic engineering holds. Scientists are advancing with a great pace along editing DNA codes. Last year, for example, they discovered a more powerful way to edit DNA sequence and changed the grey color of a mouse to white. And hence they are quite optimistic about using the method to treat cancer and other deadly diseases by replacing the infected gene from a DNA sequence. Other than that, genetic engineering will become quite popular among fashionistas. Lady Gaga may go for a Gene modification to turn her hair from peach red to I don’t know what color she would like to have. She is sort of crazy. But you must have gotten my point. Intelligent you! Because Pond’s anti-aging treatment was not enough, Maria Konavolenco entered into the field of anti-aging to stop her and us, too, from getting old. Other than that, Aubrey De Grey joining the league suggested that guys also hate turning old. These guys with many other scientists have been researching to make turning old a thing of the history in the future. There are notable discoveries also. GDF-11 – a protein which rejuvenates bones, muscles, heart, etc. – for example, and Mitochondrial Complex II which turns people old when stops working. This was discovery by Scientist of Newcastle University. The anti-aging research is still on its way. However, the day is not so far when our dream to never grow old will come true. Many beauty products of our age will die. There will be a whole new market of these products. But this is a different concept. Period. Now the time is to take you back to the present. Zoooo. So how was the ride? How about chiming in the comments to let me know? There ya go.